During this informal discussion, you will gain helpful tips for making the most of Career Fair as a creative, including identifying target employers, approaching recruiters, and translating your skills. Drop in anytime between 4:30–6:30pm. Refreshments will be provided. Business casual attire recommended. Visit 20 companies representing all nine Career Clusters. For more information or to register, visit Handshake. Learn how to prepare to be successful at the Spring Career Fair by practicing elevator speeches, knowing what to bring, researching employers, and learning how to stand out as a qualified candidate. Stop by Armstrong 0045 for Spring Career Fair guidance, led by the Center for Career Exploration & Success’ Career Assistants. *See Career Assistant Drop-in schedule for individual reviews of resumes, cover letters and Linkedin profiles. The Career Center will have limited printed materials for employer locations available at Spring Career Fair. To better serve students, the Career Center uses The Fairs App, available on both Android and Apple iOS mobile devices, to assist students in employer location and positions available. Watch a role play video of a typical meeting between an employer and a student at Spring Career Fair. Please note: Quicktime is required to view this video. Resume drop-in hours are available. NOTE: No resume drop-ins on the day-of or day-after Spring Career Fair (2/21 and 2/22). Listen to Job Fair Success, a CareerChat podcast episode featuring advice from a recruiter for Procter & Gamble. If you would like to request accommodations (e.g., sign language interpreter, materials in alternative format, etc.) for any of the workshops, events or functions sponsored by the Career Center, please contact the Office of Student Disability Services at 529-1541 (V/TTY). Registration is now available through Handshake. Registration includes a table(s), lunch, light refreshments, and parking. Payment can be made by credit card once registration is approved. Log into Handshake after approval. If paying by check, be sure to include a copy of your invoice when remitting your payment. If you wish to participate in the ‘Interview Day at Millett’ on Friday, February 22 (the day after Spring Career Fair), please make your selection during registration (a maximum of 5 tables may be requested at a cost of $25/table). If you wish to schedule interviews in the Career Center in Armstrong Student Center, submit on-campus recruiting (OCR) requests via Handshake. For recruiting questions, please contact Crissy Jessie, Recruiting Coordinator, at (513) 529-3840 or e-mail MiamiRecruiting@MiamiOH.edu. Packages must arrive at Miami University by February 20. For return shipping by the carrier of your choice the day after the fair, you must have a completed mailing label for that carrier to attach to the shipment. Pick-up of items will be Friday, February 22. Due to the large volume of items, actual shipment by carriers may be delayed a day or two. We recommend employers use their logo only for advertising. Cost of advertising is $100. Please submit all artwork to Craig Patrick at Craig.Patrick@MiamiOH.edu. Lunch will be available from 11 am–1 pm. 4 lunches are included with registration. Directions and maps are located in the Center for Career Exploration & Success employer site. Accommodations and dining locations are located in the Center for Career Exploration & Success employer site. 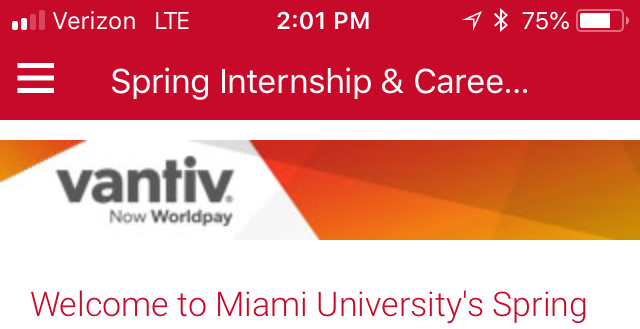 Other services available to employers visiting Miami University are located in the Center for Career Exploration & Success’ employer webpage.